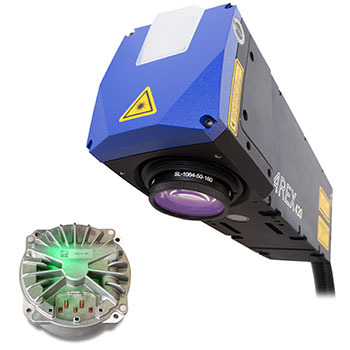 Datalogic, a global leader in the automatic data capture and process automation markets, introduces the new AREX400 family of laser markers based on fiber technology for industrial applications. Equipped with an exceptionally small and robust scanner head machined from solid aluminum, the AREX400 laser markers are unbeatable in tight space installations where a small footprint is mandatory and reliability is a must. Traceability is a core competence of Datalogic, whose laser markers are unbeatable in Direct Part Marking (DPM) product’s identification codes such as serial numbers, lot and batch numbers, 1D and 2D bar codes and human readable codes. AREX400 is ideal also for personalization and branding, as well as in industrial environments like automotive, tooling and precision mechanics, industrial electronics, home applications, surgical and medical devices. The AREX400 laser markers now incorporate Datalogic’s patented ‘Green Spot’ technology, the award-winning programmable visual indicator for immediate good read feedback directly on the scanning area. Among the features most appreciated by the market, are the ultra-compact format, the high stability, the easy integration in laser processing machines, the Ethernet embedded communication protocols, and the fact that AREX400 has been tested and verified by UL (Underwriters Laboratories), one of the most recognized and trusted authorities for product safety testing and certification. “Fully compatible with Marvis™, the first complete solution that combines Datalogic’s Laser Marking and AutoID products into a unified software environment, and with all previous Arex accessories, AREX400 is the ultimate solution for the contemporary automotive industry” stated Lorenzo Bassi, Product Marketing Manager of Datalogic. “Manufacturers who are looking for laser marking products, have to answer to several questions before selecting a product. First of all, is there a model that can solve my actual applications? Will it comply with my severe environment and with my complex installation? Will it fit in the tight space constraints in my production line? How long will my investment be up-to date? What if I need future additional features? AREX400 by Datalogic addresses all of these questions. Several models are available with various power levels, technologies and configurations that cover virtually any industrial application, both in harsh environment and complex installation. Also included is a software upgrade program that will maintain the value of the investment, introducing new important features on regular basis, and a complete program of modular add-on accessories that will ensure hassle free laser traceability”, concluded Lorenzo Bassi.